This event, presented by the Huntington Lighthouse Preservation Society, is open to all boats. 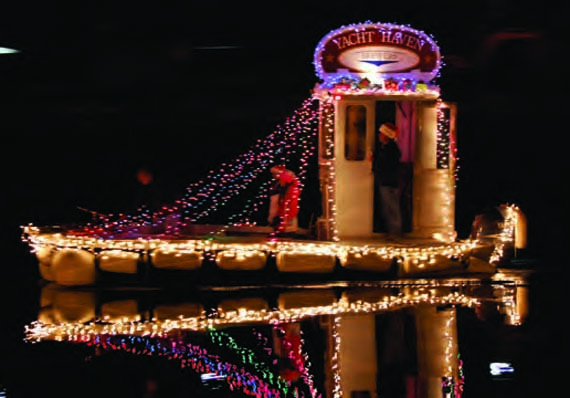 Lighted boats will parade through Huntington Harbor, with prizes awarded to first, second & third place winners. The parade starts at 6pm, and all boats must register in advance. Visit huntingtonboatparade.com for more information. Starting at 6:15pm, lighted boats will circle the harbor and prizes will be awarded. Contact Newport Harbormaster Tim Mills at 401-845-5815 or tmills@cityofnewport.com to learn more. Kick off the holiday season by decorating your boat and joining in the fun! The parade starts at 6pm, and the awards ceremony and after-party will be held at the Crab Shell restaurant, with live music and bars inside and out. This event benefits the Young Mariners Foundation and Toys For Tots. Please bring an unwrapped gift. Visit stamfordboatparade.com for more information. Following the tree lighting at 6pm in Mystic River Park, decorated vessels parade down the Mystic River. Boats of all types and sizes are welcome, and prizes will be awarded. Call 860-572-9578 or visit mysticchamber.org to learn more. Step back in time to Christmas Eve 1876 and enjoy seasonal delights including a traditional tavern dance, a horse-drawn carriage ride and the beautiful glow of hundreds of lanterns that light the way. Tours begin at 5pm and leave every 15 minutes on November 30 and December 1, 7-8, 13-14, 20-22 and 27. To learn more, visit mysticseaport.org/event/lantern-light-tours/. This month-long celebration includes a tree lighting, caroling, concerts, mansion tours, a crafts fair and many more events and attractions. Call 401-849-6454 to learn more, or visit christmasinnewport.org to see the full schedule. Highlights of this Nantucket Noel event include the arrival of Santa & Mrs. Claus on a U.S. Coast Guard vessel, craft shows, exhibitions, performances and a Christmas marketplace. For more information, visit nantucketchamber.org. You’ll find fun holiday festivities for the whole family at this event. To learn more, call 508-939-0199 or log onto edgartownboardoftrade.com. 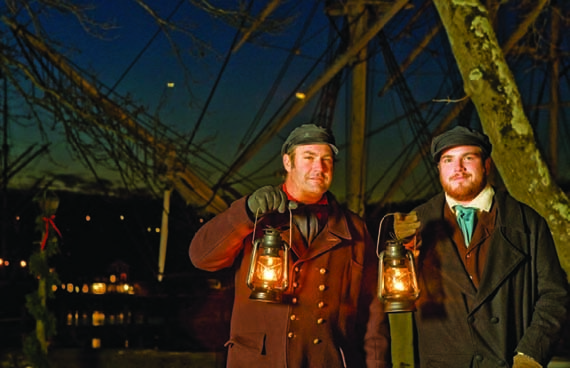 Thousands gather at Mystic Seaport every year to sing holiday carols and support the Pawcatuck Neighborhood Center. Admission is the donation of a non-perishable canned food item. The event runs from 3 – 4 pm. Visit mysticseaport.org for more information.